When it comes to fuel systems, things are constantly evolving. Why? Because the engines that they are feeding are evolving as well. Remember, for years it was pretty exotic to have anything other than a mechanical fuel pump feeding your high performance engine. As time evolved, electric pumps became much more normal and while come companies have rested on their laurels, Aeromotive High Performance fuel systems has not only kept working, they have continues to advance the technology and ability to feed the fuel needs of today’s high performance engines . Brushless fuel pumps offer major benefits over traditional pumps with brushes. They run cooler and therefore do not heat the fuel, their lifespan is longer, they draw less current, and they are more efficient. All of this adds up to a pump that is more friendly on the electrical system of your car and is more capable of delivering the volume and pressure that your modern engine needs. We live in a world where it is becoming normal for people to drive multi-thousand horsepower engines on the street and over long distances. It is also becoming normal for racers in categories like Top Dragster and Top Sportsman to be feeding big cubic inch engines with EFI on the race track and those fuel demands for both pressure and volume need to be net. 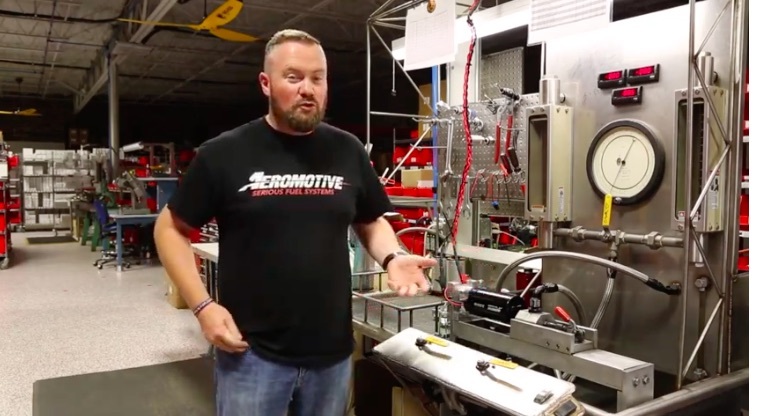 The technology in the pump is one thing but the controller for the pump is really where the magic is that that is what Aeromotive has invested time and money in perfecting. Their internal parts have always been top shelf and continue to be. In this video below we physically the benefits of the brushless pump as we look at pressure and volume on the flow bench as well as the current draw. When the pump is worked hard it does things that no traditional pump can, no two ways around it. These are available as inline pumps, as in-tank pumps, and they can be bought inside a complete fuel cell from Aeromotive. Check out the video below. The Feds Are Auctioning A 1991 Ferrari F40 RIGHT NOW - Got Half A Mill To Spare? Two Oldsmobiles, One Decision: Which One Would You Pick?